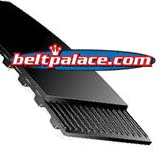 Home > Timing Belts MXL-XL-L-H... > L Timing Belts. 3/8" Pitch Trapezoidal Tooth Gear belts. > 322L075 Timing Belts, 3/4" Wide > 322L050 TIMING BELT > Bando 322L100 Timing Belt. 1" Wide. 322L100 BANDO INDUSTRIAL TIMING BELT. (322L 100-G) Neoprene with fiberglass cord and nylon tooth facing. 86 Teeth, 32.25" Pitch - 1" width.